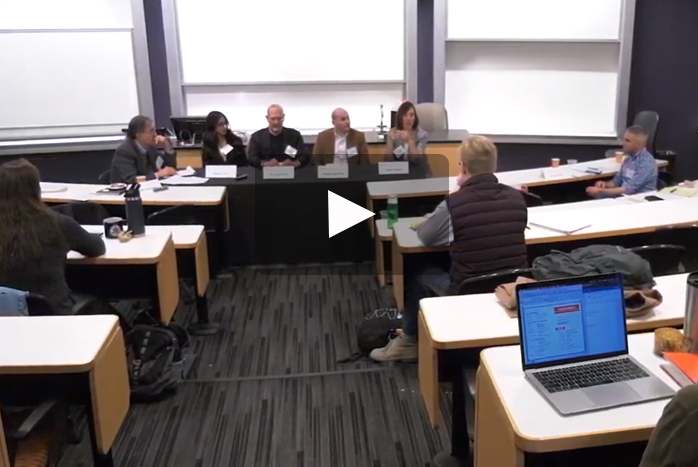 As part of the Innovation Competition at Dickinson, a group of entrepreneurial alumni and parents recently visited campus to offer students insight into how to develop a successful business. The event is one of several ways alumni and parent mentors help students in the competition develop plans for their business ideas. "I wanted to be able to come back and help them and accelerate their learning process with regards to being able to achieve some sort of entrepreneurial idea," said Robert Bowen '97, co-founder and managing partner of Partner IT, one of the alumni panelists at the event. The annual Innovation Competition at Dickinson was developed by Edward Finocchiaro '15, Alex Torelli '16 and Philip Velez '15 with guidance from Associate Professor of International Studies, Business & Management Michael Fratantuono and Associate Professor of International Business and Management Helen Takacs. The competition is open to all students and offers a competitive platform for entrepreneurial students to pursue an idea that they are passionate about. "Learning about all these business concepts from people who are in the industry [was] really inspirational," said Sajal Satyal '21, one of the students who attended the event. Learn more about the Innovation Competition at Dickinson.